If you ask us, every meal is an opportunity to eat your No Name Steak — yes, even breakfast or brunch! 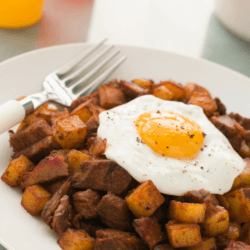 If you’re looking for a hearty dish that has the best of a savory morning meal in every bite, look no further than No Name Steak hash. Peel and cube your potatoes (figure 1/2 to 1 full potato per person, depending on size of potatoes). Cook in boiling water until barely tender then drain the water. While your potatoes are cooking, grill or cook your No Name Steaks according to the package directions. When steak is cooked, cut into bite-sized cubes. Add oil to a large skillet and saute onions, garlic and red/green peppers (if desired) until softened. Add the potatoes and saute until browned and slightly crisp. Add in the steak and cook to warm through. In a smaller skillet, melt a pat of butter and crack in the desired number of eggs (no more than four so the pan doesn’t get too crowded). Fry until the white is cooked through, but the yolk is still runny. Spoon up your hash onto a plate, season with salt and pepper to taste and put an egg on top. Good morning!